Internet overwhelm is real, guys. How many unread articles and blog posts do you have in your RSS reader? And what about those Facebook and Twitter feeds? How do we keep track of it all? As writers, we want to keep up with the latest industry news, advice and opportunities, but we don’t have time to sift through everything happening in the online world. That’s why we created this year’s list of the 100 Best Websites for Writers. Thanks to your suggestions, you’ve helped us curate hundreds of websites to bring you the best of the best. Many are tried-and-true favorites previously featured in our 2014 and 2015 lists, and we’re excited to have dozens of newcomers to showcase this year. No matter what you want to accomplish in 2016, we’re sure you’ll find quality inspiration and resources. We’ve broken this year’s list into seven categories: Blogging, entrepreneurship, creativity and craft, freelancing, marketing, publishing, and writing communities. All sites are listed in alphabetical order within their categories, and the numbers are for easy tracking (not ranking). And if you’re looking to keep up with these sites on a daily basis, here’s an easy way to do that: we’ve compiled a Twitter list of all the websites in this post. Click here to subscribe via Twitter. Warning: this list may inspire you to start your own website! If you want to start your own website or blog, here’s our step-by-step guide. Sit back and explore. Cheers to the amazing resources you’ve helped us collect! Sophie Lizard is here to teach you how to take your freelance blogging skills to pro level. Through her blog posts, free community and jobs board, you’ll be able to increase your blogging income and become an expert in your niche. In the big blogosphere, it’s hard to stand out and let your voice be heard over the noise. Jon Morrow and the Boost Blog Traffic team offer a wealth of resources to increase traffic to your site and build community — without sacrificing quality content. It’s a trustworthy blog about how to blog. Founder Darren Rowse and the ProBlogger team bring you all the latest news and tips to build a better blog. This site offers extensive resources on how to monetize your blog as well as a job board constantly updated with new opportunities. With practical and motivational articles and a free 30-day blogging challenge, Sarah and Kevin Arrow help bloggers gain confidence in their writing so they can get the recognition and reach they deserve. You’ve picked out a website name, a theme, and have your WordPress site all set up — now what? At The Daily Post, the WordPress team helps you navigate your growth as a professional writer, with daily writing prompts, interviews with successful bloggers, writing and photo challenges, and WordPress tips. Aerogramme Writers’ Studio keeps you up to date on writing news and opportunities, including contests, calls for submission, and MFA programs. The blog also contains tons of articles on the art of writing. Author Ryan Lanz’s website is a wealth of information for aspiring authors. His blog features frequent guest posts, and his Writer’s Toolbox is constantly updated with his favorite picks for websites, blogs, music, apps and people. Using research in the creative process and neuroscience, Rosanne Bane takes on the big issue of writing resistance in all its forms: writer’s block, procrastination, perfectionism and more. Her weekly posts offer science-backed fixes to common problems for writers. Maria Popova created Brain Pickings to document her intellectual, creative and spiritual growth. It’s an exploration into the brilliant discoveries of different disciplines, and how we can “cross-pollinate” these ideas to move us forward in creative thinking. Author, editor and writing coach C. S. Lakin loves helping writers get their manuscripts ready for publication. On Live Write Thrive, she writes about proper scene structure, character development, editing and crafting a fantastic story. Prolific mystery author Elizabeth Spann Craig blogs about all things relevant to a writer’s life, including public speaking, productivity, gaining visibility and connecting with the wider author community. Her weekly roundup of writing articles is also a reader favorite. Janice Hardy understands that there’s no “right” way to write. So instead of giving advice on what writers should be doing, she explains how you can make industry rules work for you. With new articles and guest columns every day, you’ll gain valuable insight into the book-writing and publishing process. With more than 10 years of studying the craft of writing under her belt, Kaitlin Hillerich created Ink and Quills to help other writers reach their novel-writing goals and tell beautiful stories. With blog posts, worksheets, ebooks and courses, there’s tons to explore. KidLit411 is the ultimate place for children’s writers and illustrators. Founders Elaine Kearns and Sylvia Liu curate the latest in the industry, including new blogs, conferences, awards, writing challenges, publishing resources. They also post weekly author and illustrator interviews and have a thriving facebook community. Live with passion, write well, and remember to breathe. These are the core principles of author Janalyn Voigt’s site, where she reminds aspiring authors that only when we lead a passionate life can we properly fuel our writing and succeed. The ProWritingAid blog is all about transforming good writing into great writing. From grammar tips, writing techniques, and software recommendations, this blog is a great resource if you’re looking to polish your prose. For more than 15 years, Script has been the top place to go for inside information on writing for film and television. With how-to articles, interviews, podcasts, influencer columns, webinars, courses and resource directories, you’ll find everything you need to keep up with the industry. Post you’ll like: Choosing Projects: Which Screenplay Should I Write Next? In her blog and newsletter, author Susan Dennard shares her secrets: from planning your novel and maximizing productivity, to facing writing fears and getting published. The number one thing all successful writers have in common? Practice. At The Write Practice, Joe Bunting and his team help you develop your writing rhythm and grow into your voice and identity as a writer. Witty Title Here is the blog “For female writers who give a damn,” offering writing advice, inspiration, writer spotlights, and more — all with a feminist twist. This site also publishes reader-submitted pieces and is a great place for writers who are just starting out and finding their voice. Writer Mandy Wallace believes that when it comes to writing, don’t wait to become inspired or for luck to strike. Just “Show up, shut up, and write,” and sooner or later it will all come together. Wallace’s blog documents the writing lessons she’s learned and offers practical guides for upgrading your own writing. Post you’ll like: Creative Work is Performance. Assess Your Creative Health Now. A writer’s website should be robust enough to support their growing online platform, but also simple to use. The team at Author Media is made of web designers, coders, and social media managers who share tips, resources, and plug-ins for fantastic author websites. In the High-Income Business Writing podcast and blog, Ed Gandia brings you everything you need to know about building a successful career in commercial writing. With over a decade of experience, he lets you in on the strategies and secrets of various industries so you can find great clients and command top fees. In the world of business, content is king — and that means your content creation, blogging, and online marketing have to be on point. Men with Pens, led by James Chartrand, has over 1,000 blog posts to help with all your content marketing, website-writing and small-business needs. Jonathan Mead at Paid to Exist believes you can and should get paid for doing the things you’re passionate about. His blog, training programs and resource “backpack” can help you create a career you love on your own terms. Penelope Trunk has founded four startups, and she knows a thing or two around building community. Read her blog for life advice, career advice, and everything inbetween. Productive Flourishing is the place for “doers,” the people who are ready to use their creative talents to help themselves and the world around them. At Productive Flourishing, you’ll learn about the new world of work and how to thrive in it. To be a great entrepreneur and make your mark in this world, you have to be able to own who you are and believe in yourself. The team at Riskology presents science-backed strategies for embracing who you are and going for your goals. Seth Godin’s daily bits of wisdom on business, marketing and life help you approach your work in new ways. His posts never fail to inspire an energy to “Go, make something happen.” No matter your industry, Godin’s blog is not to be overlooked. At Side Hustle Nation, you’ll learn how to take your tiny entrepreneurial streak and propel yourself to full financial freedom. Nick Loper’s blog and podcast spotlight different types of side gigs, along with case studies to fuel your business savvy. Author Joanna Penn has built a best-selling writing career, and she wants to help you do it, too. Her site has a wealth of resources on self-publishing and platform-building — from her articles and ebooks to her popular podcast library of author interviews. At The Identity, Lis Dingjan and her team help entrepreneurs build beautiful websites, courses, applications and systems. Her blog is an archive of her thoughts about system development, creativity, entrepreneurship, marketing, and going for your goals. “Your life is YOUR life. You should be able to do whatever you want with it.” So says Karen Marston, founder of Untamed Writing, her internet home for helping people build a freelance writing career they love without having to sacrifice their freedom. Here you’ll find a full archive of blog posts, resources, and courses to develop your writing skills, fearlessly approach clients, and maintain a successful career. You have a great online business and an active blog. Now it’s time to up the ante and create some digital products. Look no further than Marya Jan’s website for guidance on creating ebooks and online courses. This site lives up to its name, with hundreds of practical posts on how to market your skills, price your projects, and deal with the nitty-gritty aspects of a freelance business. Around for more than a decade, About Freelance Writing is a tried and true favorite for many writers. On the first of each month, Cathy Bryant posts an extensive list of competitions, contests and calls for submission. She notes whether they’re paid or not, for quick skimming. This site is a great one-stop-shop for all recent writing opportunities. Post you’ll like: How Does a Freelance Writer Stay Organized When They’re Too Busy? You live to write, but remember that as a freelancer, you’re also an independent business owner. This means dealing with contracts, handling your own health insurance, figuring out taxes and more. The Freelancers Union is the major hub for everything having to do with living a great freelancer life. The founders of Freelance Writers Academy say enough is enough when it comes to low wages and content mills. In this community of freelancers helping freelancers, you’ll find valuable advice and resources for freelance business building as well as employment leads. With a job board updated daily and more than eight years of freelance writing and blogging tips, this site is a favorite for writers all over the world. It’s regularly updated with all the latest trends and resources freelancers should know about. Lauren Tharp has found a way to write as a freelancer full time and is dedicated to helping other writers do the same. With bi-monthly newsletters and blog posts along with a brand new podcast, LittleZotz is a great source of practical tips for your freelance life. At Make a Living Writing, Carol Tice is dedicated to helping writers move up from low-paying marketings and start earning more from their work. With her blog, ebooks, and paid community, you’ll find awesome advice, support and resources to grow as a freelance writer. As a full-time freelance writer, John Soares loves what he does. But he’s also interested in getting the most out of life and not having to work around the clock. At Productive Writers, he shares strategies to help freelancers get high-paying gigs, finish them quickly and get back to life. Freelancing isn’t the same everywhere in the world. Mridu Khullar Relph created The International Freelancer to provide targeted advice and resources to freelancers who work outside of the U.S. and U.K. This community is also a great source of support for U.S.-based writers looking to break into the global market. Above all else in your freelance career, you want to build a business that feels good, is fun, and is totally you. Ash Ambirge provides an entertaining (and often NSFW) take on being fearless in your business ventures and dealing with the hard stuff in a bada** way. We often think that to be successful, we have to follow the rules and play the game. At the Renegade Writer, Linda Formichelli offers advice on breaking into the world of writing by breaking the rules. If you’re looking to build a freelance writing career on your own terms, this is the site for you. Subscribe for free to gain access to Winning Writers’ database of writing contests. When it comes to book publicity and marketing, you can definitely DIY it. Author and public-relations star Sandra Beckwith provides articles, training programs and other resources that help take the guesswork out of book marketing. We all have a story — a key message we want to share with the world. Through her blog and corresponding radio show, Dorit Sasson helps writers, entrepreneurs and thought leaders build a trusting relationship with their audience so they can share their message and reach new levels of success. Don’t let low confidence get in the way of your marketing success. Join Jessica Lawlor and the #GetGutsy community to find inspiration and tips on how to step outside your comfort zone and go for your goals. Michael Hyatt is the bestselling author of Platform: Get Noticed in a Noisy World, and his blog will help you do just that. Read for tips and resources about personal development, productivity, leadership, influence and more. Recognized as a top entrepreneur and influencer by The Wall Street Journal, Forbes, Entrepreneur, and even President Obama, Neil Patel is definitely a go-to guy for all things online marketing. He’s helped companies like Amazon and NBC increase their revenue, and his insanely useful content is sure to help your business as well. Shelley Hitz believes everyone has a message, and she’s on a mission to help you reach your target audience and build your author platform. With her blog posts, podcast, and Author Audience Academy, you’ll find tons of content on book writing, publishing, and marketing. To be successful in business, you’ve got to be able to persuade. At Social Triggers, marketing expert Derek Halpern shares his best tips, strategies and scripts for growing your audience and making the sale. His techniques are data driven, using the latest finds in psychology and social behavior. Bernadette Jiwa says the secret sauce to great marketing is building context and understanding between you and your audience. Read her blog if you see marketing as not just a department, but also part of a holistic — and successful — entrepreneurial experience. Getting published is hard, and it only gets more complicated with a rapidly growing and shifting industry. That’s where Author.Pub steps in: helping aspiring authors manage the overwhelm of the publishing and marketing process through blog posts, guides and directories of trusted names and companies in book publishing. The Bent on Books blog is run by Jenny Bent and a team of literary agents. Every month, they share their agent “wishlist” — the types of books they are looking to represent — as well as advice on marketing, publishing, working with an agent and more. Founder and author Jenny Bravo offers personal anecdotes and guidance for writers who want to take a leap into the publishing world. The blog itself reads like a story, so it’s best to start at the very beginning to watch Bravo’s own publishing process unfold. Best-selling author Jeff Goins created his site to inspire others to awaken to their creative gifts and develop their true voices. Through his blog posts, podcasts, and newsletters you’ll get an inside peek into the life of a successful creative professional, as well as practical advice for pursuing your own art. One of the most popular blogs in publishing, Chuck Sambuchino’s Guide to Literary Agents is the go-to place for all types of information on finding literary agents, sending query letters, building an author platform and marketing your book. Consider K. M. Weiland your writing and publishing mentor. With hundreds of blog posts, instructional e-books, and an exclusive e-letter, her website is the perfect place to find the answers to all your burning questions. She also responds to every email she receives (really!) about writing, publishing and marketing fiction. Through her blog posts, weekly writing exercises, and 12-week book development courses, Mary Carroll Moore is devoted to helping writers bring their novels to fruition so they can move forward in the publishing process. Indies Unlimited is an overwhelming source of writing, publishing, tools and news resources for independent authors. With thousands of blog posts and weekly features like Tuesday Tutorials and Thrifty Thursday, you’ll always be able to learn something new. Follow along on Jody Hedlund’s writing journey. Her blog is full of advice, encouragement, and inspiration about writing and surviving today’s challenging publishing industry. Non-fiction and freelance writer Lisa Romeo blogs on various helpful topics, like how to reclaim your writing life, get through troublesome pieces and navigate the business of writing. Her biggest piece of advice? Write first, and read blogs second! Post you’ll like: Unfinished: When it Comes to Personal Stories, Aren’t They All? At Literary Rambles, blog partners Casey McCormick and Natalie Aguirre interview and highlight children’s book authors, literary agents and agencies. Get an inside look at the world of children’s book publishing. Rachelle Gardner’s website is one of the most popular literary-agent blogs. Her blog archive is a great resource for sound advice on how to find and partner with the right agent, hone your elevator pitch, write a query letter and more. Post you’ll like: What’s an Author-Agent Agreement? You’ve written your book. Now what? Standoutbooks has tons of articles, templates, tools and resource recommendations for getting your book published and marketed to the max. Be sure to grab your free Book Marketing Plan and Press Release templates. If you’re looking for the honest — and often hilariously vulgar — truth about writing, Chuck Wendig is your guy. He’s not afraid to say what we’re all really thinking, which makes Terribleminds the perfect place to gain some writing confidence and get back to creating. Established editor and industry insider Alan Rinzler offers advice on traditional publishing, self-publishing, landing an agent, marketing and more. At The Kill Zone, you get access to the minds of 11 top suspense writers and publishing professionals. Each day brings new blog posts and insights into publishing, marketing and the writing craft. Navigating publisher and writing contracts? Want to brush up on your knowledge of intellectual property litigation? Attorney David Vandagriff offers his (sometimes snarky) musings on the legal side of the writing business. You have a fantastic manuscript, and now it’s time to make it into a beautiful book. Author, editor and graphic designer Dave Bricker offers straight talk on the book production and publishing business, with insights on book design, typography and marketing. YA writer and soon-to-be-published author Ava Jae has made Writability her internet home for five years, sharing vlogs, book reviews, writing tips and how-tos, and blog posts about her own journey to getting published. First impressions count, and that rule still applies in the writing world. At 1st 10 Pages, writers can post the first 10 pages of their work, to be anonymously reviewed by established industry insiders. Submit the beginning of your novel or movie script and see if you’re hitting the mark. This Facebook group of nearly 10,000 traditional, self-published and indie authors has been around since 2009. It’s a popular source of community and camaraderie without slimy self-promotion. The community also publishes three anthologies a year. Check out their member guidelines here. At Scribophile, you’re sure to get high quality feedback on your work. The community works on a “karma points” system, in which you spend points in order to submit your writing, and receive points when you provide exceptional critiques. Scribophile also hosts free writing contests and hosts an active forum. Learn more about Scribophile here. Over 27,000 writers of all levels of expertise have joined this buzzing community, founded by author Kamy Wicoff. At She Writes you can create your own profile, build your network, share your work, get expert advice and feedback and discuss all types of things in the forum. The Amazon Kindle platform has branched out, creating an ultimate online community for writers at any stage of the creative process. Here you can talk shop on everything having to do with writing and publishing, and you can submit your writing and ideas for reviews and feedback. Start on the writer’s forum. To spotlight smaller blogs, Yeah Write hosts weekly writing challenges for nonfiction, fiction and poetry, and microstories. The entire community gets to vote on the most impressive stories and discover new favorite writers. Check out the writing challenges of the week. What writing sites would you add to this list? Did we include all your favorites? We are thrilled and honored to be on the list. Two Drops of Ink is also taking submissions. We support, promote and encourage our guest writers. So, if your site didn’t make the list, consider a guest blog. Congratulations, Marilyn! Thank you for providing great content and being so supportive of your community. What an incredible list of resources! So happy to see Jenny Bravo’s ‘Blots and Plots’ listed – she’s an incredible writer and offers her readers some great advice, plus a fantastic sense of community. I was also just wondering if this list includes any Australian writers’ sites? That’s a great question about Australian writers. Many of these sites are run by groups of writers from all over—I’m sorry I didn’t keep tabs on specifics! If you have any recommendations for great Australian writers’ sites, we’d love to hear from you! As for Aussie recommendations, myself and a team of dedicated creative writers run Writer’s Edit (http://www.writersedit.com/) which provides writing advice, industry news and feature articles, as well as a short story and poem of the month. The Australian Capital Terriory (ACT) Writers’ Centre also runs a really insightful blog called Capital Letters (http://actwritersblog.com/) that often goes behind the scenes of a writer’s life. Congratulations, Scott! Thank you for providing such an excellent resource to your community. Fantastic list. Please consider mine next time around: Writing.Rocks. Thanks for the inspiring resource. Thanks for compiling this list. I recognise several I already follow, and I’ve spent some time checking out the rest. PS: I know there are a lot of gurus who preach about how to create a great site that attracts and gathers visitors (hoping to sell products or services), however some of the things they suggest make the site appear too commercial and become a turn off to the average visitor (or fan). Ads that pop into my face and want my name and email address as soon as I arrive are ones I x-out of immediately. The pop-up is rude. There was a time when the Internet would block pop-up ads, but lately, they seem to be everywhere. I got a nasty virus last spring from a pop-up ad, and I don’t care to repeat that ordeal. Thank you for including Better Novel Project! YAY! I love that you made a twitter list to follow!! Congrats, Christine! We love Better Novel Project. Well compiled list! What, no travel writing section? Well, never mind, go to http://www.PitchTravelWrite.com to get your travel writing & blogging fix. Thanks for the recommendation, Roy! Thanks for including my blog again! So many great resources here. I’ll be sharing the list, and checking out those that are new to me. Congratulations, Lisa! And thanks for sharing the list! 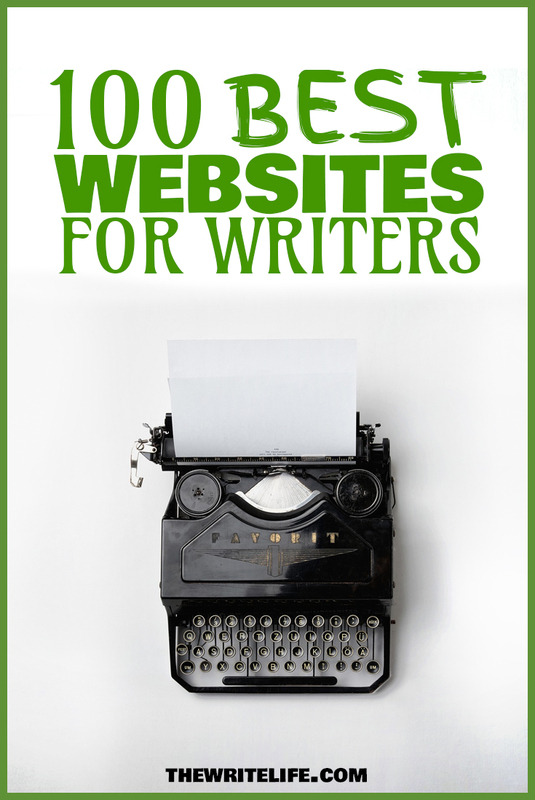 Thanks you so much for naming my site on The 100 Best Websites for Writers! I’m truly honored to be in such great company. Of course, Mandy! Thank you for providing such great content to your community. Happy writing! What a delightful surprise to find my name on this “best of” list – honored to be included! Wonderful list! Thanks for including Live Write Breathe. Thanks so much for including Literary Rambles. We’re thrilled! I commend you for including Shelley Hitz of Author Audience Academy. If you’re looking for a writing coach you can trust to provide comprehensive training and first-rate support, you won’t find a better resource. Thanks for sharing your experience, Wayne! Happy writing! Love Shelley Hitz and this list! Thanks so much for sharing this great list of resources. Thank you for including Comps and Calls! I am so thrilled! It’s lovely to see Hope’s Funds for Writers and Adam’s Winning Writers up there too. I plan to visit the sites that I don’t yet know. What a marvellous resource this list is! Thanks again! Thanks so much, Cathy! I’m glad to hear you’ve found some new sites to check out! Awesome list. I hope to get on it one day soon. Honestly my biggest problem with #50 Freelance Writing Jobs, is that many of the links end up taking you to flexjobs.com, which seems legit after some research, but charges a fee. That is daunting right there. I am not paying a fee just to look at what jobs are available. I get SSD & just lost my part-time job at a club, so writing is all I have. I certainly can’t shell out money to find a job. Thanks so much for sharing this, Layla! We’ll keep this in mind for the future.